Installing a subpanel is a good remedy for an overcrowded panel, and it's also a way to avoid running circuits in distant parts of the property back to the main panel. 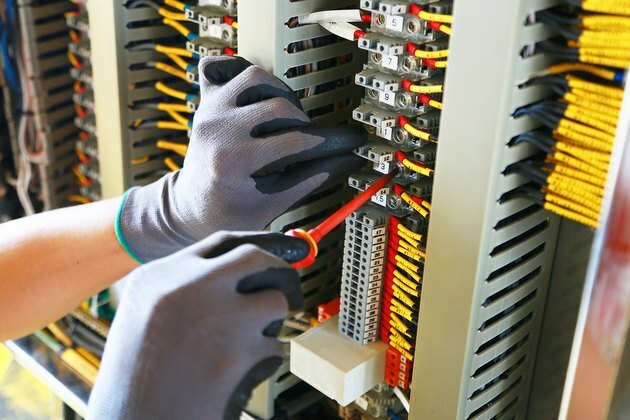 The size of the subpanel depends on what you plan to connect to it, and it also depends on the capacity of the main panel. A subpanel plugs into the main panel by means of a double-pole breaker, and it can't exceed the amperage rating of the main panel. The subpanel enclosure must be securely attached to a wall or other stable surface with the fasteners recommended by the manufacturer. You can install it outside, but you must choose a panel approved for exterior use. You must provide from 3 to 4 feet of clearance on all sides of the panel depending on the voltage to ground. You may not know this voltage, so it's best to provide 4 feet. The panel must be easily accessible, so don't install it too far above the floor; 4.5 to 5 feet is about right. The cable you run from the main panel to the subpanel also depends on the amperage rating. You can use 10 AWG, three-conductor wire for a 30-amp panel, but for a 60-amp one, you need 6 AWG wire. If you're installing a 100-amp panel, you need 4 AWG copper or 2 AWG aluminum three-conductor cable. Remember that three-conductor cable actually has four wires: two hots (red and black), a neutral (white) and a ground (bare). The ground doesn't count as a conductor. When you install a main panel, the ground bus is bonded to the neutral bus, but when you install a subpanel, you cannot have this bond. It would potentially energize the ground wire and render ineffective all safety devices controlled by the panel, such as GFCI outlets. Panels often come with the neutral and ground bars permanently attached, and you must ground the neutral bar to the metal enclosure with a ground screw. If you're using the panel as a subelectric panel, you need to install a separate ground bar and throw away the grounding screw. Most manufacturers provide predrilled studs to accept the new ground bar. Sand the paint off the enclosure to ensure a good electrical connection between it and the ground bar. If the ground and neutral busses are connected by a bonding plate but are otherwise separated, simply remove the bonding plate. You connect the cable to the subpanel by attaching the hot wires to the lugs on the hot bus bars, the neutral wire to the neutral bus and the ground wire to the ground bus. After running the cable back to the main panel, you're ready to make the connections to energize the subpanel. If you're inexperienced working in a live panel, hire an electrician for this part of the job. The electrician can also check the wiring on the subpanel to make sure it's safe. You can check your own work by consulting panel box images online, but nothing substitutes for a professional opinion. The hot wires connect to a double-pole breaker with the amperage rating of the subpanel. You need two adjacent spaces on the main panel for this breaker. If the panel is full, you may have to shift one of the 240-volt circuits or two 120-volt circuits to the subpanel to make room. Connect the neutral wire to the neutral bus and the ground wire to the ground bus, turn on the main breaker and the subpanel breaker and the subpanel is energized.